Primer: Touch In Sol No Poreblem Primer, since hearing my best blogging friends rave about this primer I've wanted to try it and the lovely Siobhán got it for me as my Secret Santa gift! I've only tried it a few times so I will reserve my final thoughts for a future post, it's definitely smoothing although not more then my other smoothing primers and unfortunately has that slippy feel to it which I'm not the biggest fan of but I'm excited to use it with different foundations to see how well it's performing. Foundation: Maybelline SuperStay Full Coverage Foundation in Ivory, even though I have quite a few high end foundations I seem to reach more often for my drugstore offerings and this, newly reformulated, foundation has really impressed me. It offers good medium to full coverage and it really stays on all day. My only criticism would be that it oxidise a bit so I would recommend getting a shade lighter. Concealer: Milani Retouch + Erase Concealer in Light, I have finally tried this concealer and I'm really enjoying it, it covers my under eye darkness really well and once set with powder stays without creasing or disappearing all day! Powder: No7 Airbrush Away Translucent Powder, I love using this to set my under eyes as it's really smoothing and I often set my foundation with it too. It's not the best at keeping my face matte but it gives nice airbrushed look to my skin without being powdery or cakey. Bronzer: Too Faced Milk Chocolate Soleil Bronzer, my all time favourite bronzer, I use it almost every time I do my makeup, perfect shade for my complexion and fantastic formula. Blush: Becca Mineral Blush in Flowerchild, beautiful formula and subtle pink for a flush of colour to my cheeks. Highlighter: Becca Champagne Pop, gorgeous golden highlighter whether you want some subtle glow like me or you'd like to be seen from the space this should have you covered. 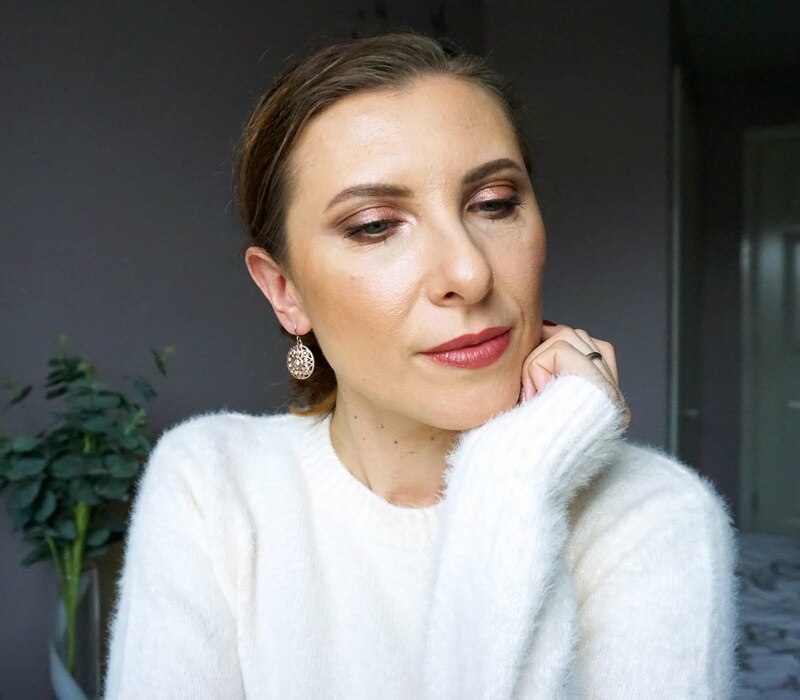 Brows: Glow Skin Beauty Brow Quad in Brown (review), I was never a fan of brow powders yet this compact has quickly become my 'go to' to fill in my brows, so easy and my brows last all day! 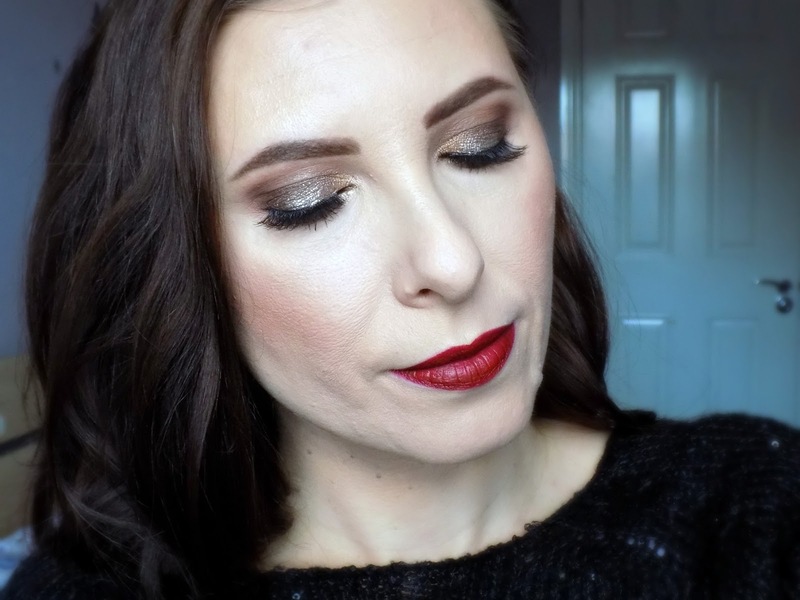 I have recently re-discover the Chocolate Bar palette and I've been loving it so much! 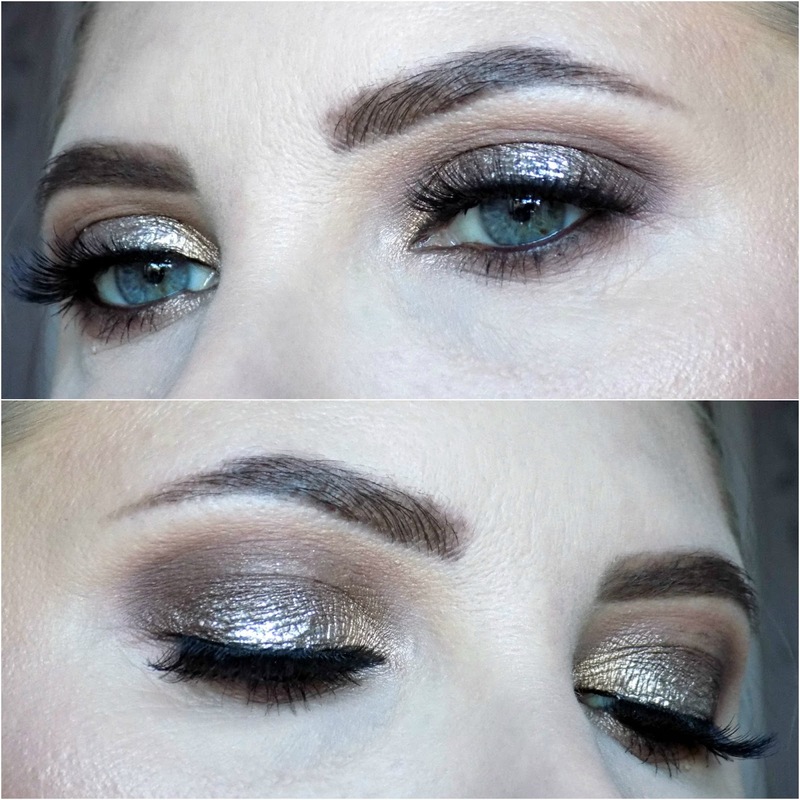 To create the eye look I blended Salted Caramel in and above my crease and on the lower lid, to deepen the outer crease and outer corner of my eye I used Semi-Sweet. 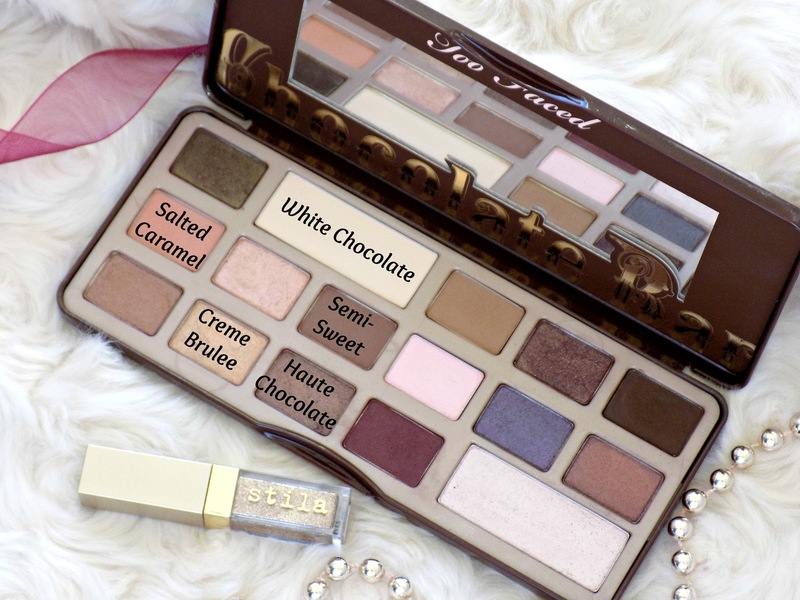 To clean up the edges and highlight my brow bone I used White Chocolate. On my lid I apply Haute Chocolate from the outer corner to the centre of the lid and Crème Brulee from the inner corner to meet the Haute Chocolate. 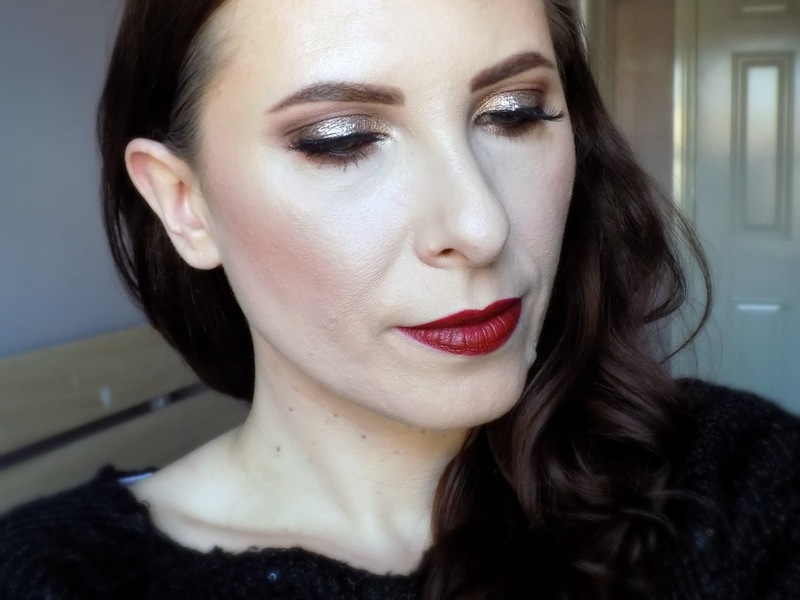 Then, concentrating on the centre of my lid I added the Stila glitter for that festive sparkle. Eye pencil: Makeup Geek Full Spectrum Eye Pencil in Espresso, to line my upper and lower water line for extra definition and smokiness. Mascara: Maybelline The Falsies Push Up Angel, I like this mascara for a subtle definition and that is exactly what I look for when I know I will be wearing false lashes. Also the wand of this mascara is perfect for lower lashes. 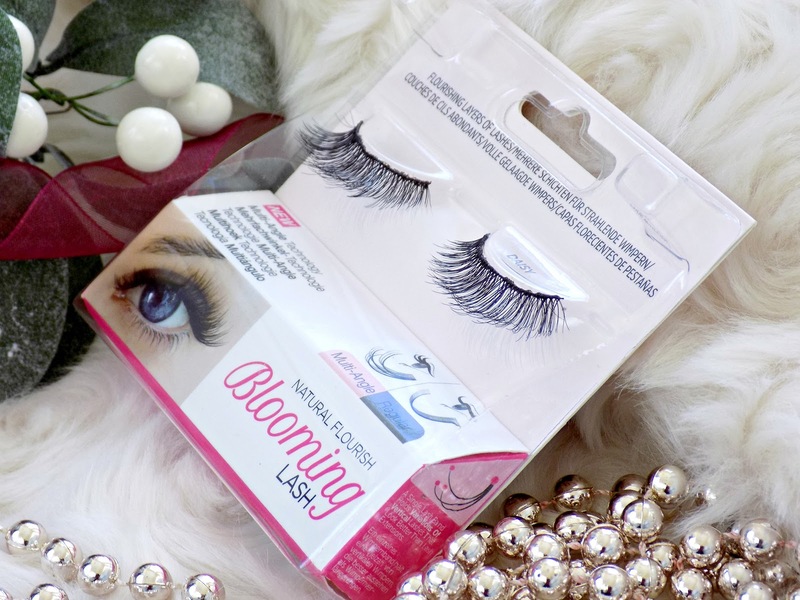 False Lashes: KISS Blooming Lash in style Daisy*, there's no party look without false lashes for me and this pair, sent to me by False Eyelashes, is perfect! They add a bit of drama to my eyes without being OTT, are very comfortable to wear and look fairly natural thanks to the multi-angle of individual lashes. I love them! Lip liner: Max Factor Colour Elixir Lip Liner in shade 10 Red Rush, to define my lips which is very important when wearing bolder shades. 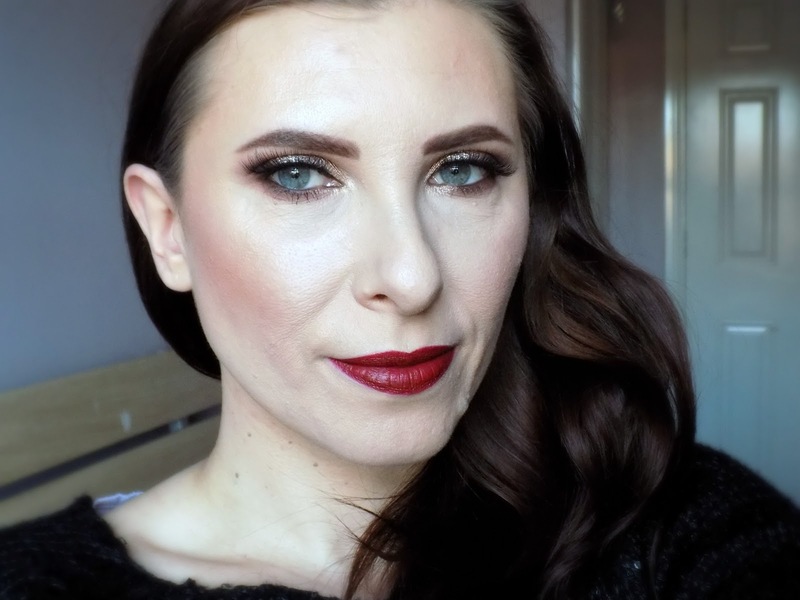 Lipstick: The Balm Meet(e) Hughes long Lasting Liquid Lipstick in shade Adoring, beautiful deep red shade, perfect for Christmas, the formula is long lasting but not drying so you'll look great all night! 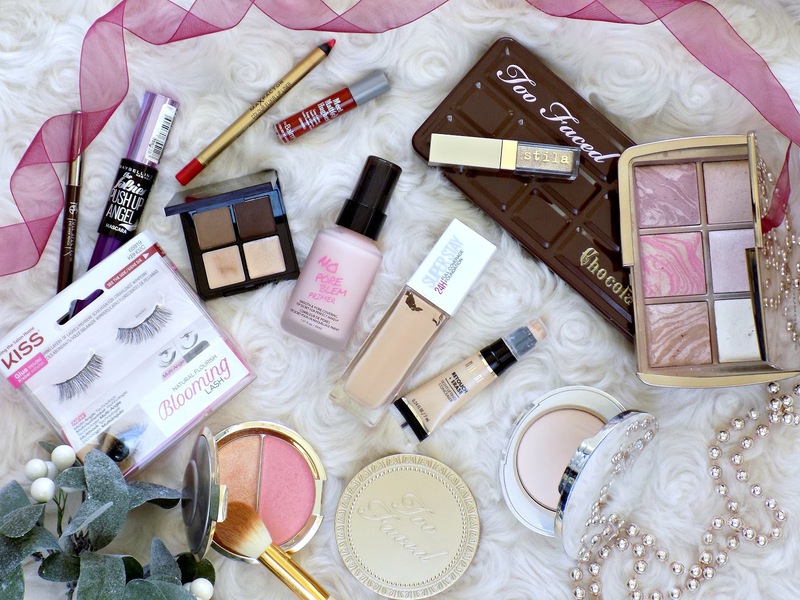 What kind of makeup look is your 'go to' for Christmas parties? As it's my last post of 2017 I'd like to wish all my readers and followers a wonderful Christmas and a happy New Year! PS. 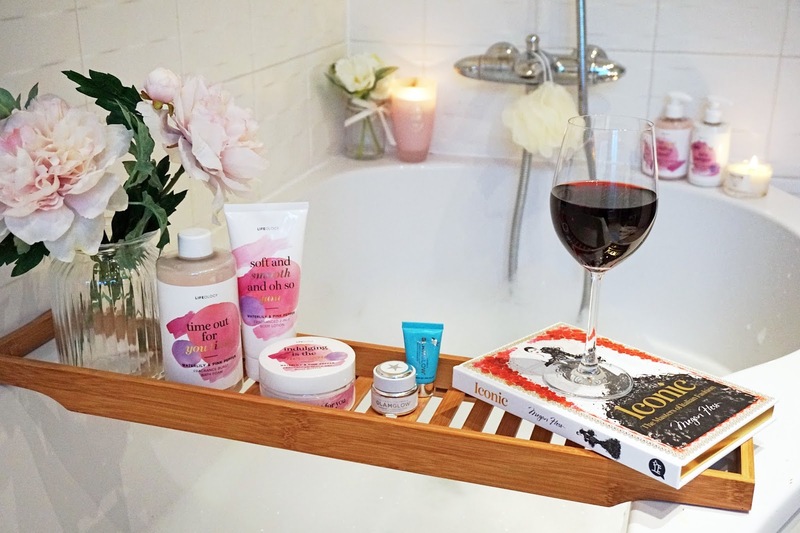 I've been struggling with blogging in the last few months, as you might have noticed, its' been a mixture of having less time due to starting a new work and just lacking motivation. I still enjoy it, albeit less then last year, so I don't think of quitting it but I need a proper break. Growing my blog and social media following, especially Instagram, seems impossible lately and although I never was focused solely on numbers it does feel disheartening when all the effort and hours put into blogging don't seem to pay off. But be assured that I am forever grateful for all the supporting, kind people I've met through blogging and great opportunities I was offered. Starting my job in May had a big effect on how much 'free' time I have and I seem to be always rushing with my posts, hardly sticking to my previously strict schedule and feeling, more often then not that, it's an another chore not a hobby I used to love so much. So I'm looking forward to some time off blogging, especially that I will be working even more during the festive period, and just get a little perspective on it all. Perhaps plan and draft some posts in advance which would be very helpful. I hope you'll stick around and will be here when I'm back in January with new content and, fingers crossed, consistent schedule!